Ontario Equestrian presented a cheque for over $28,000 to Equine Guelph, for research, as part of their new branding launch during the Ontario Equestrian (OE) Member Appreciation Party at the Royal Agricultural Winter Fair on November 7, 2017. 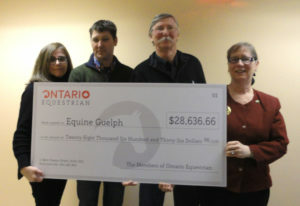 Fulfilling the decision of the OE Board and their promise to members in 2016, $1.50 per 2017 OE member was accrued (in replacement of the plastic membership card) into the Ontario Equestrian Member Equine Research Fund to be sent to Equine Guelph at the end of every year as part of the Equine Guelph annual research allocation. In a recently circulated survey, OE members were asked to choose where they thought the most benefit would be gained for their horses: 1) respiratory health research or 2) gut health and colic prevention research. Over 5000 members voted and gut health and colic prevention was the majority choice. This builds on an already active area of research on the health of the digestive tract. For example Dr. Katrina Merkies is investigating the effects of steaming or soaking hay for horses, research by Dr. Scott Weese has shown that metabolic disorders are associated with changes in gut microflora and Dr. Arroyo is investigating equine gut contents and its crucial role in health with a simulated glass gut model. For horses kept in domestic situations, it is important that we understand what contributes to gut health and how to prevent issues like colic, colitis and other disturbances. This area of research focuses on greater understanding of the functioning of the digestive tract and the prevention of issues. 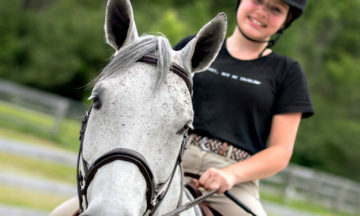 “Ontario Equestrian has been a long-time and valued partner with Equine Guelph and we have joined in many partnership programs that support horse health, welfare and safety. This new research funding, as part of their new re-structuring program, is a great addition to the Equine Guelph research program at the University of Guelph and will build on existing areas of expertise at the University in support of horse health” says Gayle Ecker, director of Equine Guelph.